We’re always looking for simple art activities and engaging learning opportunities for our children, aren’t we? Today, I have my friend Meri Cherry here to show us how to set up an Invitation to Create with flowers. The process works for other creative invitations as well and is an easy way to incorporate more process art activities into your home. Thanks for having me here on The Artful Parent! Jean is a long-time friend and inspiration. I am grateful for the opportunity to share some fantastic Process Art Activities we’ve been working on here in Los Angeles, including an invitation to create using flowers. 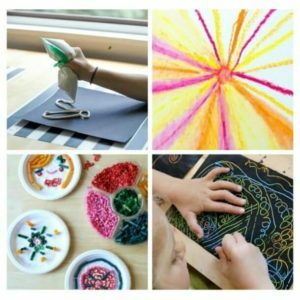 If you’re a long time reader of The Artful Parent, then you are probably familiar with the term Process Art. Process Art is art about the making and the doing part of art, rather than the finished product. I have been passionate about Process Art for a long time and talk about it pretty much all the time over at my blog, Meri Cherry. I’ve become so passionate about it that I created a whole toolkit called the Process Art Toolkit, so that moms, dads, educators, caregivers, and grandparents can learn more about process art and how to easily implement it into your daily routine. Invitations to create are mini activities you can set up for your child (set up takes only 5 minutes or so) that have great value, such as increasing fine and gross motor development, creative exploration, connection, communication, expression, and much more. This invitation to create, called Flower Bouquets, came from a list of 15 Invitations to Create in the toolkit. Basically, you set out a tray or placemat with a bouquet of flowers, a pair of scissors and several small vases with water. I recommend that you set this up when your children aren’t around. This adds to the exciting discovery of the activity and also makes setting up a more peaceful experience for you. No need to get elaborate; a simple bouquet to start with is just fine. You can even pick flowers or greens from your backyard if you have them this time of year. You can see a much more simple set up below. Once your child or students notice the set up you’ve created, invite them to create their own flower arrangements using the tools you set out for them. They can clip the flowers, petals and stems however they choose to make their own bouquet. You might even want to keep a paper and colored pencils or markers nearby so they can draw what they see after they arrange their bouquet! The bouquet could be for a special room in your home or a gift for a special friend or family member. You can decide that together or let your child decide. The important thing is that you’ve created something inviting and engaging for your child that they can spend time creating and making their own creative decisions about. My girls created these bouquets for a birthday party at our home. I usually shy away from dyed flowers like this, but my girls begged when we saw them at Costco and I succumbed. Nothing wrong with an artificial rainbow bouquet every once in a while! Besides, they had a blast making these special bouquets. They clipped and clipped until every vase in the house was full. I hope you’re feeling inspired to set out some Invitations to Create for your children or students. And if you want to learn more about Process Art, check out the Process Art Toolkit. It’s filled with tons of easy to implement, super fun process based ideas for your family and students. As a special offer to Artful Parent readers, please use the code ArtfulParent at checkout to receive 10% off your order. Happy Holidays and thanks for reading along! Meri is the owner of Meri Cherry Art Studio, a process based art studio for kids in Los Angeles. Meri Cherry, yes, that’s her real name, is an arts and crafts blogger at mericherry.com. She lives in Los Angeles with her husband and two young daughters. Meri is the owner of Meri Cherry Art Studio, a process based art studio for kids in Los Angeles.